Seldom do I write reviews of books that have to do with grazing. Too many espouse particular points of view that apply only to a certain subset of grass-based farmers. Others are fluffy tomes that aim to affirm readers’ beliefs of what’s right and wrong. More than a few are written mainly with the idea of selling products and services. Too many are full of hype about some purported new revolution in grazing-related management. 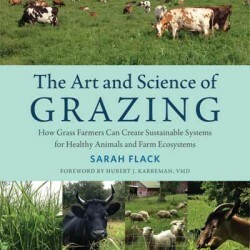 Sarah Flack’s The Art and Science of Grazing (Chelsea Green Publishing) avoids all of the above. 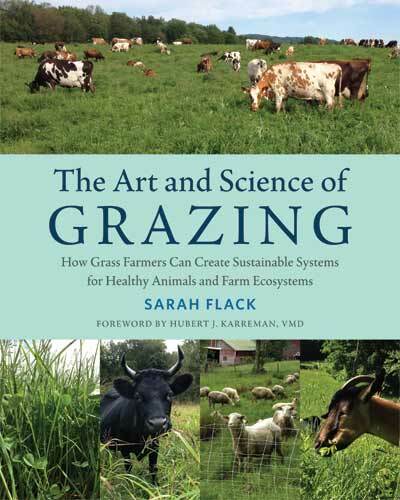 In this book, Sarah, a grass farmer and well-respected grazing consultant, offers perhaps the best all-around grazing manual since Bill Murphy’s Greener Pastures on Your Side of the Fence, first published about 30 years ago. Probably this is not a coincidence, as Sarah once studied under the University of Vermont grass master. Nothing here knocks your socks off. No proclamations of radical new, hyper-profitable ideas are contained herein. But also nothing that will make a veteran grazier shake his or her head at some sort of nonsense that has already been disproven. Instead, this is an A to Z manual that serves as a topnotch guide for beginning and intermediate grazing managers of all ruminant species, with practical management advice ranging from deep in the soil on up through the plants and the stock (and people) running the show. This book offers sound advice to those who are at the stage of figuring out forage species, system design and livestock nutrition. While top-end graziers will know most of what’s here, Sarah offers some thoughts that at the least are worth chewing over. You may disagree with a few of the details — or at least the feasibility of those details for your own operation — but in general you will agree that what’s being said makes sense. And I’ve known a few veteran graziers who aren’t following some of the sound advice and practices that Sarah is offering. Unlike many other such books, the goods and bads of many decisions are put forth here. 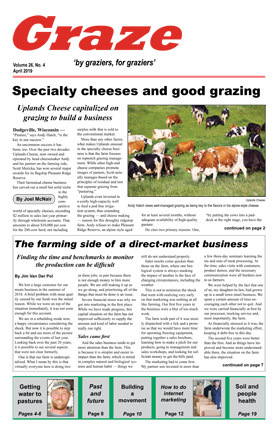 For instance, a discussion of the benefits of multiple daily herd moves, as in mob-stock grazing, is balanced by verbiage about the labor/cost implications of such management. She is realistic about the limits of “year-round” grazing. This balancing is a general theme in this book, and it is of course essential to an agricultural system that is all about proper balance. Her understanding of pasture damage and how to avoid it is pretty much spot on. I find value in the “Troubleshooting Pasture Problems” appendix. Of particular value, at least for me, is Sarah’s discussion of no-grain meat and milk — particularly the parts addressing the growing grassfed dairy sector. Shortfalls? I would have liked a section about employing different grazing strategies to achieve specific objectives. A section on economics might have had value. And while Sarah does a very good job of discussing the basics of soil health, this fertile field deserves more detail regarding some of the latest biological science. Next book? Overall, though, as a manual for putting the concepts of grazing into a workable set of practices that actually make sense, The Art and Science of Grazing is a resource worth having.